WHAT PROBLEMS DO WOODPECKERS CAUSE? Most everyone likes woodpeckers. There are many species commonly found throughout North America including the flicker, gila, acorn, downy, hairy, redheaded, green, black backed, ivory billed, sap sucker and pileated. When in the wild, the site of a woodpecker pecking away at a tree is generally an acceptable behavior. But sometimes this pecking can be offensive; often times damaging. Note the accumulated damage to this tree caused by one persistent woodpecker. 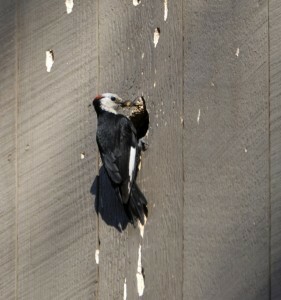 In most cases, the woodpeckers have found the targeted wood because there is some kind of food supply living inside. Typical insects that will nest in trees or house siding include carpenter bees, wasps, boxelder bugs, house borers and ladybugs. Though having the woodpecker feed will help reduce the problem insect, in most cases the damage sustained from the pecking can lead to many other costly repairs thus making the behavior unacceptable. If you’ve got one of the above listed insects living on or in your home, be sure to treat to help reduce their numbers. In many cases this will cause the damaging woodpecker to move away. In cases where you are unsure what the woodpecker is feeding on or if it’s even feeding at all, try one of the following repellents. Woodpeckers will also peck on anything which will generate loud “sounds”. They will typically find metal edging, hollow backed siding, soffits and even windows to use for this mating ritual. Most commonly done in the spring, woodpeckers will repeatedly beat their pecks against anything which makes a loud noise as they try to establish themselves as a dominant bird in a given territory and get a mate. Woodpeckers will also peck for food and lastly, they’ll peck to build nests. The ways to repel woodpeckers vary and its best to first determine why the woodpecker is focused on your structure. As stated above, they will generally come to a structure for food, nesting or to mark territory. If woodpeckers are randomly pecking on the side of your home foraging for food, killing the active pest will usually get rid of them. But if you’re unsure what pest is, then spraying the active sight with PEST RID can cause them to stay away. Pest rid uses food grade actives which are super concentrated. This both tastes bad and tends to “alert” certain animals like woodpeckers to stay away. For limited areas, Pest Rid could keep them away. Treat every 2 weeks but if the problem persists after 1 month, get the Attack Spider listed below. A quart will treat up to 125 sq/ft and should be applied every 2 weeks for optimal results. But remember, if the food source is scattered to different parts of the structure, you may end up driving the birds to another feeding area. If this happens, you’ll need to get either the ATTACK SPIDER or SOUND REPELLER listed below. If you have large areas to treat and plan on getting the gallon jug of Pest Rid, you’ll need a good PUMP SPRAYER to get it applied. For woodpeckers randomly showing up on fascia boards, gutters, stucco siding or any painted or stained part of the structure, add NBS PAINT STAIN ADDITIVE the next time you finish the exterior surface. NBS will embed in the paint or stain lasting a year or more. Like Pest Rid, it makes insects and animals not want to be on or around the treatment. For woodpeckers randomly pecking to “sound”, this treatment can get them to go elsewhere. 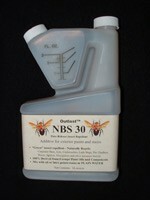 NBS can be mixed with any standard paint or stain and you’ll need a pint per 5 gallons of finish. Originally created to repel insects, it has been found to repel a range of animals too. If woodpeckers are appearing randomly on the home, set up BIRD TAPE. for longer lasting repellent action. This tape comes in long 25 foot rolls and can be cut to any length. The best way to use it for woodpeckers is to cut three 6 inch lengths which can then be hung just over the active site on the home. Use a tack, nail or screw to attach it to the home. When sunlight shines on the tape it creates an optical illusion to birds. Flat and weatherproof, Irritape is perceived by woodpeckers as a threat and cause their natural “fright-flight” response to kick in. In most cases this will cause them to move away and forage elsewhere. 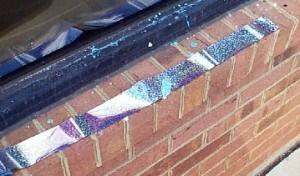 Bird Tape is ideal for windows where woodpeckers are pecking at their reflection. It can also be used for crop and garden protection or even on a tree you see peckers targeting. Another effective option is the MOVING SPIDER. This mechanical device looks like a large spider and is activated by any subtle vibration. When nearby motion is detected, it will release an 18 inch length of cord which causes the spider to drop down from where it’s mounted. Motion, movement and vibrations will activate it like those created by a wood pecker which is either pecking for food or sounding for mating/marking territory. The device looks like a large spider complete with legs, head, eyes and mandibles. Two “AA” batteries power the spider and there is an on/off switch located on the bottom (batteries are not included with the Spider). You will need to use a Phillips head screwdriver to remove the side panel for loading the batteries. This panel is located under the fur of the spider and held in place by Velcro straps. There are two eye hooks for mounting the spider onto siding of the home which are best suited for screwing into wood or stucco. Mount these above the area you want to protect and place the spider flat against the surface of the material being pecked. When the woodpecker returns the spider will be activated and this motion will scare them away. 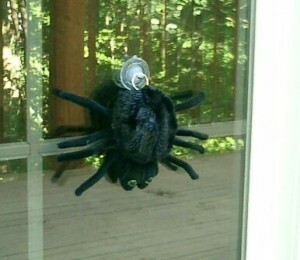 The Attack Spider is very effective at repelling unwanted birds and you’ll get instant results where deployed. Use one spider for every 10 x 10 area needing protection. The following video shows the Attack Spider in motion. Lastly, we have an SOUND REPELLER that works very well for birds including woodpeckers. Basically it uses both ultra sound and predatory bird sounds to chase away woodpeckers. 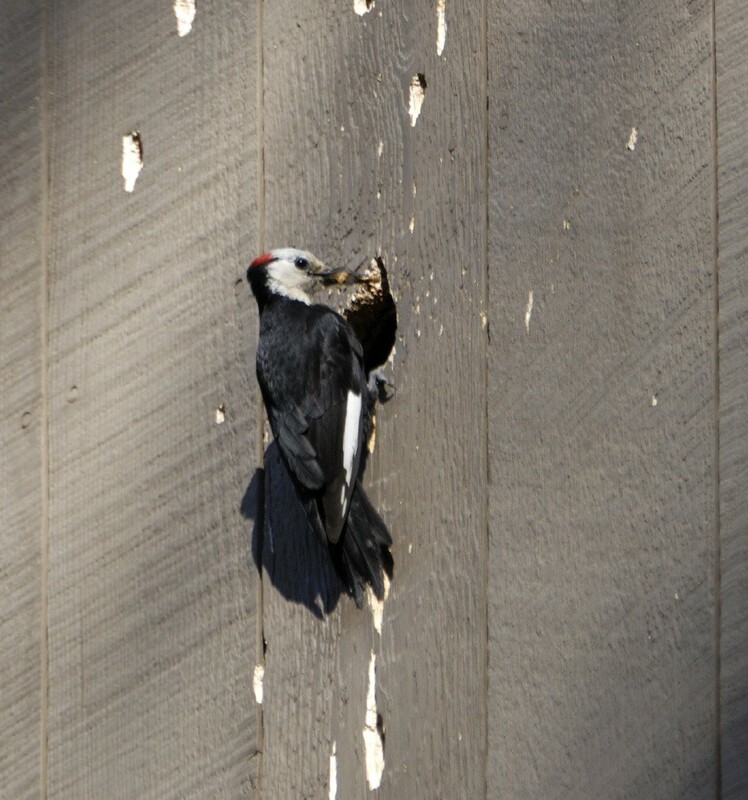 When placed in line where woodpeckers are active, you can direct the sound at the siding to keep the birds away. Results are instant and you have two options for setting them up. The first option is for small areas. So if you have a woodpeckers targeting a piece of metal or one area of the home, position the device within 25 feet of the area you need protect. Using 4 “c” cell batteries, you can set it to “motion detection”. This setting will release a strong ultra sound deterrent woodpeckers do not like. Our unit also has an audible sound, much like a hawk, which can be controlled volume wise. If possible, keep this turned up so when the unit sounds off, it will release both ultra sound and the predatory sound. When activated, woodpeckers will immediately leave. 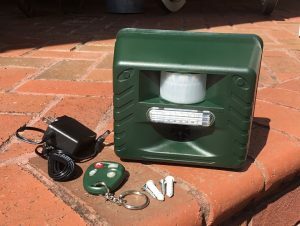 The motion detector has an effective range up to 30 feet but the sound will be heard for 100 feet or more. 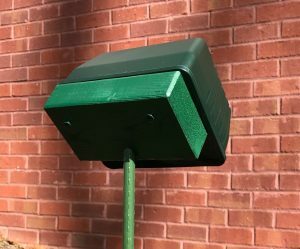 For large areas, like the whole side of you home, plan on positioning the unit on the ground pointed up at the home.Our MOUNTING BLOCKS are ideally suited for the installation. In this scenario, running it all day long (you can set it to run during the day only, during the night only or all the time. For woodpeckers, during the day only is enough) using nothing but Ultra Sound will keep the woodpeckers away all the time. This unit can cover up to 5,000 sq/ft, has a wireless remote for on/off control and is weatherproof. Considered the “best” option for woodpeckers, you will get instant control when devices are set up properly. Woodpeckers are generally not thought of as “annoying” or “nuisance birds”. But if conditions are conducive around your home and some start to appear on the structure, they can become a problem. Woodpecker control cannot be done directly to the birds but by employing some of the products and equipment detailed above, you should be able to safely and effectively chase them off your home.